Water-colour drawing with pen and ink of two sculptures of Jain figures from the Jain Matha at Shravana Belgola in Karnataka. This drawing is taken from an album containing 56 sheets of drawings (60 folios) mainly of miscellaneous architecture and sculpture in the Deccan and S. India, dated 1793-1806. Some drawings are by MacKenzie himself, others by his draftsmen, including C. Ignatio. Shravana Belagola, situated 70 km north of Mysore in Karnataka, is one of the most famous Jain pilgrimage places in southern India. The village lies between two temple-studded hills, Vindhyagiri to the south and the smaller Chandragiri to the north and is dominated by the huge monolothic image of Gommateshvara which represents Bahubali, the son of the first Tirthankara who renounced the world and obtained enlightenment after defeating his brother Bharata in battle. The erection of the monolith in 981 was patronised by Chamundaraya, a general of the Western Ganga dynasty. The site was established in the 9th-10th century and continued to be developed under the Hoysalas and after during the Vijayanagara and Wadiyar periods. 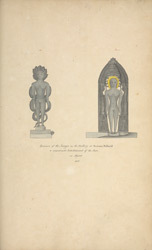 This drawing depicts two Jain figures from the collection of bronze figurines, mostly 19th century, Western Ganga period, that are housed in the Jain Math, an 18th-19th century building which consists of a series of shrines arranged around a courtyard and represents the sdministrative centre of Shravana Belagola.